There are five cost factors that have to be considered when making a comparison between the costs for underfloor heating against radiator heating. Many professionals in the building industry consider only the first of these, and make poor decisions as a consequence. It is important to assess each of these cost factors in turn to gain an appreciation of the real cost benefits of using Underfloor Heating. Homeowners, once happy with radiators are now demanding much more from their central heating systems and have become more style conscious than ever before. However, whilst style and design are key issues for the homeowner, cost, health and safety remain high on the agenda. It is important to assess all of these factors to gain an appreciation of the real benefits of using UFH. In any project, the materials for an UFH system are more expensive than the cost of mass-produced steel radiators. However, the cost premium is reduced greatly if the radiators must be Low Surface Temperature (LSTs) and can disappear altogether if you use some forms of designer radiators. Independent studies have shown that UFH is less expensive and quicker to install than radiators, and this leads to overall project time on site being shortened by a week or more. This is because UFH is largely a first-fix item. On practical completion, ‘snagging’ costs are lower with UFH, and post-completion warranty costs are also generally lower. When all the initial costs are taken into account therefore, the cost of UFH is often lower than radiators even on the basis of the most simplistic comparison. As a consequence of being sited near to or below windows – in order to counteract the effect of downdraught from the glass - radiators lose much more energy through windows than UFH, and the heat loss through ceilings is also higher. UFH also uses much cooler water than radiators and this ensures that: the condensing boiler operates at its most efficient condensing mode. 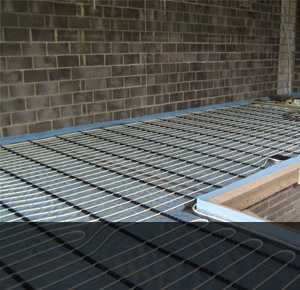 UFH also limits the loss of heat from pipes, distributing the heat around the building when compared to radiators. Generally, UFH is 10-25% more efficient than radiator heating, although in tall spaces such as industrial units, the savings can increase to 60-70%. It is estimated that by not having heaters on the walls, there is 15% more space within a room, enabling homeowners to place furniture in the most convenient or desired place. However safety and health factors are also crucial as radiators can contain water at 70oc and carry a risk of contact burns and collision damage. UFH by comparison however reaches no hotter than 29oc, approximately the temperature of the palm of your hand - much safer for young children and the elderly. For allergy sufferers, there are further benefits. UFH does not produce a strong convective air movement so the transfer of fine dust into the air within a room is minimized - a significant benefit for asthmatics. It therefore seems inevitable that at some point within a building’s life, large surface heat emitters will have to be fitted. However retro-fitting a UFH system is often very expensive but if installed in the first instance it is both cost efficient and energy efficient. In the future, new trends or technology may emerge, such as ceiling heating. For now, however, UFH is proving to be the desired choice for homeowners. Installers should take advantage of this growing trend whilst there is still a margin to be made. > Not enough time for cleaning?